This pretty bamboo basket is a versatile decorative basket. The storage basket has been lovingly hand-crafted. The slim bamboo bowl is approximately 7 cm big and 3.5 cm tall. The base diameter is 3.5 cm and the inner filling height is 1.5 cm The basket is very versatile. Each storage basket is lovingly hand made and is made from 100 per cent natural material. Use the small bamboo bowl as an Easter basket for holding candy and gifts. Or use the woven basket as a plant pot, as a table decoration or perhaps in a doll’s house. Arrange flowers, nibbles or gifts in the basket or use the woven bamboo shell as a storage basket. The chip basket is also ideal for soap in the bathroom. You will receive either 5 or 10 decorative baskets in a set for all your crafts, floristry or as decorative storage. The Lashuma Wellnessmanufaktur wishes you much joy when decorating and designing. You will receive either a set of 5 or 10 woven chip basket. The woven baskets are great for all your jewellery making, floristry or for packed with lots of fun decorating ideas. The hand filling baskets you can wonderfully as a table decoration for any occasion (wedding, christening, birthday or any other). As a miniature bread basket for every single one guest or filled with treats position the host or hostess gift. It serves in the snack fruit bowl made from spun bamboo nuts, fresh herbs or finger food. The round wicker basket can be also ideal used as a gift basket. For example, with a little Easter for Schok. and Easter bunnies/, or as a funny egg cup for Easter breakfast in the morning. Or as packaging option for party favors on the festive table. Weddings they give the kids a basket with pretty flowers as a litter basket. Decorate the table or the holiday plaque with the flower bowls made from bamboo. Range your guests soap and product samples into the bamboo basket. The figurines basket can anywhere be used. 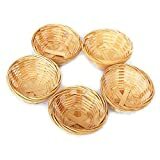 As a bread basket in the kitchen, as snacks displayed in your home living room, as a flower basket in the doll house in the children’s room or as a soap dish in the bathroom is the hand-woven bamboo basket can be used everywhere. The Made carefully by hand braided cutting cups can be also be used as a great mini gift basket. In Diameter is a bamboo basket approx. 7 cm and is approx. 3.5 cm high. So you can write a small presents and gifts all decorative packing and arrange.